If you're thinking of joining the U.S. Navy or have already done so, you may want to become a commissioned officer. By providing many paths to a commission, the Navy can more effectively meet its personnel needs while taking into account a variety of individual circumstances. The right road for each individual is determined by balancing two basic factors: What the Navy needs to man the fleet and what the person is qualified to do. Here are some options outlined in an article in the U.S. Navy's "All Hands" Magazine. The United States Naval Academy (USNA) offers an opportunity for qualified young persons to embark on careers as naval officers. All Academy applicants must have a nomination from a member of the executive or legislative branches of government (e.g., a congressman, senator or the president) to be considered for appointment. There are many nomination sources; applicants should apply to all of them. Each year, the Secretary of the Navy may nominate for admission to the Naval Academy 85 active-duty Navy and Marine Corps enlisted personnel and 85 Navy and Marine Corps Reserve personnel either on active duty or assigned to a drill unit. 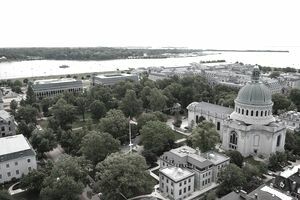 The Naval Academy Preparatory School (NAPS), located in Newport, R.I., provides intensive instruction and preparation for the academic, military, and physical training curricula at the USNA. NAPS convenes each August with the course continuing through May of the following year for candidates seeking July admission to the Academy. The Naval Reserve Officer Training Corps (NROTC) scholarship program leads to an appointment as an officer of the Navy or Marine Corps in the grade of ensign or second lieutenant respectively. The NROTC programs are maintained to educate and train well-qualified men and women for careers as commissioned officers. The NROTC program is designed to provide the Navy with unrestricted line officers. Only persons who are open to the possibility of making their career in the Navy or Marine Corps should apply. The Navy is engaged in a vigorous effort to ensure that opportunities for a career as a naval officer are open to persons who may have been educationally deprived, but who have demonstrated they possess the fundamental qualities and desire necessary to gain a commission. To help these individuals achieve their potential, the Navy developed the Broadened Opportunity for Officer Selection and Training (BOOST) program. BOOST prepares selected individuals for entrance into the NROTC Program or the USNA. ECP provides enlisted personnel, who have previous college credit, a full-time opportunity to complete requirements for a baccalaureate degree and earn a commission. The CWO program (along with the Limited Duty Officer Program) is one of the primary enlisted-to-officer programs that does not require a college education. CWOs provide technical expertise at a relatively stable grade level in the officer structure. The LDO program is another enlisted-to-officer program that does not require a college education. The LDO meets the Navy's needs for officer technical managers. OCS provides 13 weeks of officer candidate indoctrination and training. Selected enlisted members are designated officer candidates upon reporting to OCS in Pensacola, Fla. The program is open to male and female personnel except for the submarine, surface nuclear power and Special Warfare (SEALS) programs, which are not open to women. After completion of initial operational training and fleet tours, Seaman to Admiral program officers will have the opportunity to earn their baccalaureate degrees at the Naval Postgraduate School in Monterey, Calif. Service obligation is four years from appointment as a commissioned officer. Navy medicine offers an alternative to the administrative burden and expense of private practice for physicians, dentists, and medical service corps officers. The Medical Service Corps in-service procurement program is a continuing program which provides a path of advancement to commissioned officer status for senior regular Navy hospital corpsmen (HM) and dental technicians (DT) E-5 through E-9 who possess the necessary potential, motivation, and outstanding qualifications. This program is extremely competitive. Enlisted personnel aspiring toward appointment in the medical service corps should begin preparation early in their careers through a sound self-improvement program. This four year, extremely competitive program to an accredited medical school accepts applications from service members who have a baccalaureate degree and have taken all of the required pre-med courses. Students serve in pay grade 0-1 while in the program, regardless of previous rank, and are promoted to 0-3 upon graduation. Graduates incur a seven-year service obligation (following residency completion) and receive a doctor of medicine degree. This is an extremely competitive program for applicants desiring to become a physician, dentist, or optometrist. Applicants can apply for 2-, 3- or 4-year scholarships. Persons accepted into this program receive a commission in the Naval Reserves on inactive duty until they graduate, when they are advanced to lieutenant and enter active service. Graduates incur a year for year obligation (following residency obligation) based upon the scholarship received. The Medical Enlisted Commissioning Program offers enlisted personnel of all ratings the chance to become ensigns in the Nurse Corps by allowing them to obtain their bachelor of science degree in nursing.